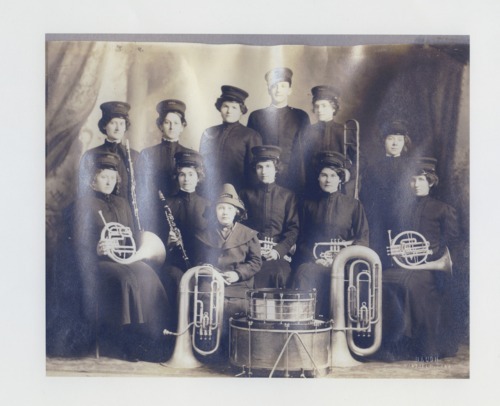 This black and white photograph shows the women's band from Udall, Kansas. The members have been identified as the following: FRONT ROW: Lucille Greenland; snare drum, Marie Beebe; clarinet, Elinor Beebe; tuba, Mr. Kelsey; band leader, Agnes Miller; trombone, Ella Hoop; clarinet, Absent; Pearl and Gladys Dunlap. BACK ROW: Blanche Hammon; cornet, Flora Miller; bass drum, Blanch Rutter; cornet, Hazel Kiser; melephone, Effie Greenland; melephone and Edna Carlton; baritone.